Looking to expand your ZWEIHÄNDER Grim & Perilous RPG GRIMDARK Edition bestiary? Look no further – say hello to the Orkish WAAAR! Party. If there is one menace that nearly everyone knows and fears, it is that of the Ork. Savage humanoid mutants that seem to spawn without number, the only blessing keeping them from overrunning the known world being their infighting and inability to organize. It is spoken that Orks cannot reproduce, only able to grow their numbers by a terrible mutation spread across the slaughtered. Victims of an Ork’s blade sometimes undergo a horrendous transformation. A deadly fungus crawls across their corpse – spreading at an alarming rate – during the putrefaction and decomposition phase. This fungus seals wounds, and as the body swells with barbaric thew, the viscera are hardened by cirrhosis. As this happens, the face of the corpse changes from its deathly pallor to a porcine-like image. And by the new moon, the victim is reborn, drawing its first breath as a vile Ork. This process has confounded even the foremost of academic minds, but there is no doubt that the seeds of corruption must first be present before this terrible fate for the slaughtered can occur, for not every victim of an Orkish attack results in revivification into this putrid form. What little culture the Ork inherits from its transformation revolves exclusively around eating, fighting and ploughing slaves. They form massive WAAAR! 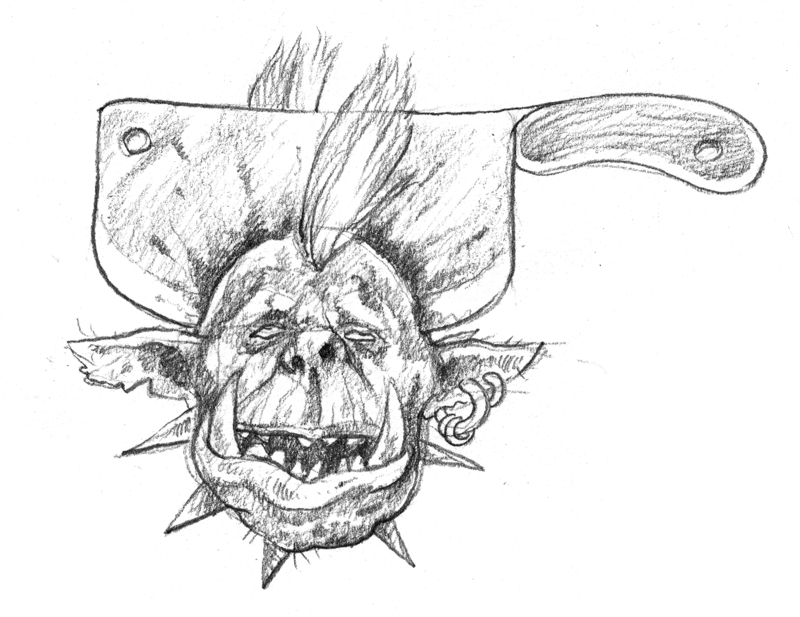 parties, tribes that are host to thousands upon thousands of Orks whose goal is plunder, rapine and decapitation. Ork infighting is common, with a majority of casualties coming from ravaging coups, bloody arguments and poorly-plotted murders. Unless led by intelligent High Orks or Ork Bigbosses, these lowbrow mutants slaughter themselves in a vicious cycle of death and rebirth. They revel in their cruelty, laughing and mocking adversaries in the broken tongue they once spoke before. Luckily, Orks are supremely easy to trick and beguile, but attempting to parlay is often a death sentence. Download ORKS for the ZWEIHÄNDER Grim & Perilous GRIMDARK Edition beta here!